…Shastriji made an unambiguous statement. He said that if necessary India may attack raiders bases and the tussle may last long. 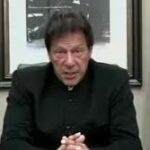 He also said, “India cannot go on pushing the Pakistanis off its territory. The Pakistan Army officers received training in United States and Britain and joint military exercises were carried out. Thus, by 1965, Pakistan had completely modernised its armed forces with new equipment received from the United States. It had also been able to upgrade the so-called Azad Kashmir forces or forces in Pakistan Occupied Kashmir. Pakistan had also concluded a treaty of co­operation in military and economic affairs with China. The armed forces had taken over Pakistan Government after a military coup in October 1958. General Ayub Khan became the new president of Pakistan. By 1965, Pakistan was ready for another war with India. On April 9, 1965, 51 Infantry Brigade of the Pakistan Army crossed the international border into the Rann of Kutch and captured Sardar Post near Kanjarkot. On April 24 Pakistan attacked again with tanks and artillery and captured four more posts and the entire Kanjarkot area. The Indian Army did not put up any significant fight and withdrew. Possibly it was surprised and not in a position to resist. 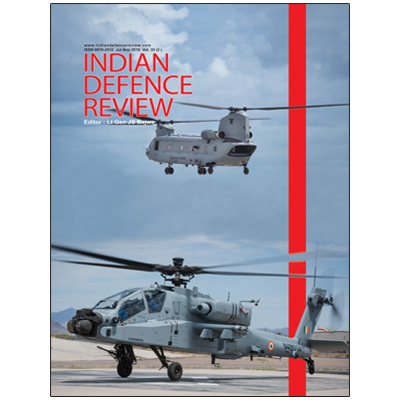 It was reasoned that the monsoon flooding of the Rann of Kutch would, in any case, drive the Pakistani Army out. It was also not militarily and logistically prepared to drive out the Pakistani forces. Soon after capturing the Kanjarkot area, Pakistan offered to negotiate. India refused saying that there could be no talks till Pakistan vacated the areas illegally occupied. However, Shastriji met Ayub Khan at the Commonwealth Conference in London. Under the influence of the British Prime Minister, a cease-fire agreement was signed on June 30. Under the agreement Pakistan agreed to withdraw its forces and restore Indian control over the area. India agreed to allow Pakistan to use a road it had constructed in Indian Territory. In April 1965, along with the invasion in Kutch, Ayub activated the cease-fire line (CFL) in Jammu & Kashmir. There were many cease-fire violations by both sides. Next, in May, Pakistan launched operations at Kargil to cut-off the Srinagar – Leh Highway. Pakistani infiltrators crossed the CFL and occupied three high hill features (possibly Tiger Hill, Tololing and Pt 4875) astride the Highway and established observation posts. Pakistan attacked again with tanks and artillery and captured four more posts and the entire Kanjarkot area. The Indian Army did not put up any significant fight and withdrew. From these observation posts, they brought down accurate artillery fire on the Highway and disrupted the traffic. India reacted by complaining to the UN observers. Nothing happened. The Indian Army then launched operations to evict the intruders. This was successfully done on May 17, 1965. However, the positions were vacated in June 1965 when UN Observers were posted in the area. While a cease-fire was being negotiated in Kutch, Pakistan was preparing for its next attempt to capture Kashmir. This was to be achieved through clandestine infiltration of a large number of guerrillas in early August 1965. The operation was code named OPERATION GIBRALTAR. The designated forces were to infiltrate in small groups and concentrate on August 7, mingle with the crowds to celebrate the festival of Pir Dastagir Sahib on August 8. Next day, they were to mingle with crowds assembling to demonstrate against the arrest of Sheikh Abdullah and commence operations. It was a bold and brilliant plan. The Indian intelligence as usual had failed to obtain any specific information about it. But fortunately for India and unfortunately for Pakistan, the plan misfired. On August 5, two infiltrators in green salwar kameez approached a youngster near Gulmarg and offered him money for some information. The individual immediately reported the matter to Tanamarg Police Station. The same day a few infiltrators approached a local man in Mendhar area for some information. The local reported the matter to the nearby brigade headquarters. The alerted Indian Army captured two officers on August 8 near Narain. Their interrogation revealed the whole plan. Some incidents of firing and subversive activities were reported between August 10 to 12. However, the security forces throughout the length and breadth of the State were alerted. A counter operation was launched against the infiltrators. Without local support they had nowhere to go. They were stalked, engaged and liquidated piecemeal. They were completely demoralised. Some surrendered. Some exfiltrated across the CFL. Large quantities of arms and ammunition were captured. OPERATION GIBRALTAR had collapsed by August 12. A silent attack in difficult terrain in most adverse weather conditions caught the enemy defending Sank by surprise. While the mopping up operations were going on, Shastriji made an unambiguous statement. He said that if necessary India may attack raiders’ bases and the tussle may last long. He also said, “India cannot go on pushing the Pakistanis off its territory. If infiltration continues, we will have to carry the fight to the other side.” The Indian Army had also concluded that the only way to stop infiltration was to retaliate by crossing the CFL boldly and plugging the routes used by the raiders and the areas used by their supporters. 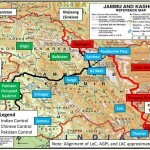 This’ plan was put into operation on August 15 in the Kargil Sector. The Indian troops crossed the CFL and recaptured the three Pakistani positions, which had been captured by them and vacated in May. Some heights in Tithwal and Uri Sectors were also captured. India also decided to capture the Hajipir Bulge, which was an important hub of Pakistani infiltration operations against India. 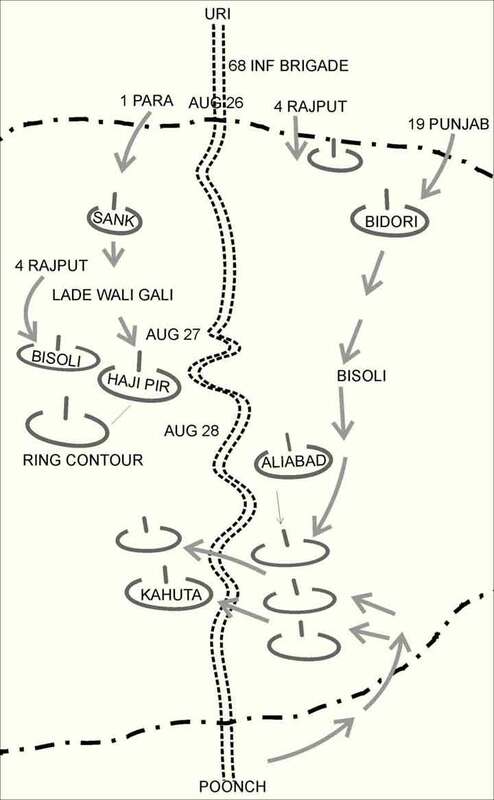 The task of capturing Hajipir Pass and the Bulge was given to 19 Infantry Division and the corps reserve of 68 Infantry Brigade was placed under the command of 19 Infantry Division for the operation which was code named OP BAKSHI. 25 Infantry Division was given the task of linking up with the force from Poonch under code name OP FAULAD. About one brigade of the enemy including some POK battalions held the Hajipir Bulge. Of this about one battalion was holding the northern approaches to the pass. The assessed disposition of the enemy is shown on Map No 10. The troops had well prepared defences and were supported by artillery. It was appreciated that a frontal assault on the pass astride the Uri – Poonch track would be very costly in terms of casualties and unlikely to succeed. The eviction of the enemy by an indirect and difficult approach was considered to have better chances. The plan of action envisaged a pincer movement from the west and east converging on Hajipir. …reason for the victory was the ability of the Battalion to exploit success. A defeated enemy requires time to regroup, reorganise and put up a fight. 1 PARA gave the enemy no time to reorganise and put up a fight after the loss of Sank. 7 BIHAR (161 Infantry Brigade) was to capture Tilpatra and Ziarat by first light D-day and Burji on Night D-day plus 1. 6 DOGRA (41 Mountain Brigade) was to capture Mehandi Gali and Lunda on the night of D-day plus 1. 1 PARA was to capture Sank and Lediwali Gali by 0500 hours on D-day plus 1. 4 RAJPUT was to pass through 1 PARA and capture Hajipir Pass by 1800 hours D-day plus 1. The plan of attack on the Bedori or eastern approach was that 19 PUNJAB would capture Ring Contour, Pathra and Point 12330 (Bedori feature) by 0900 hours D-day plus 1. Thereafter, 19 PUNJAB was to exploit up to Point 11107 and establish contact with 1 PARA by 1800 hours on D-day plus 1. JAK RIFLES and 4 SIKH LIGHT INFANTRY were held in reserve. The D-day was initially fixed as August 25, 1965. Due to heavy rain it was postponed to August 26. 68 Brigade crossed the CFL in two columns on August 26. 1 PARA crossed to the west and commenced its attack on Sank; a formidable feature with well prepared defences, barbed wire and mines, at 2130 hours. The Brigade Commander, Brigadier Z A Bakshi, accompanied the assaulting troops. II was raining heavily and it was a difficult climb. The attack was silent. The troops reached the top of the feature at 0415 hours next morning. The enemy were completely surprised and fled leaving behind their heavy weapons including two machine guns and three light machine guns. The battalion continued exploitation without giving the enemy any chance to reorganise and put up a fight. They rushed Sar, the next feature and captured it by 0930 hours August 28. They pressed on, and all areas up to and including Ledi Wali Gali were captured by 1800 hours on August 27. The Indian casualties in the attack were 21 wounded. The enemy casualties were 10 killed, 40 wounded and one taken prisoner. The leadership of Brigadier Bakshi and Major Dayal was outstanding. Their gallantry and personal example inspired their men to perform great feats of bravery and endurance and achieve what was considered impossible. Major Ranjit Singh Dayal, who was the hero of the battle, asked for permission to press on to the Hajipir Pass immediately with his company. The permission was granted. Major Dayal and his company accompanied by an artillery officer started at 1400 hours on August 27. As they descended into the Valley, they came under fire from the western shoulder of the pass. There were minor skirmishes with the enemy withdrawing from Sank. Towards evening a drizzle began and a thick mist enveloped the mountain. This made movement and direction keeping difficult. The men had already been in battle for almost two days and were quite exhausted. But Major Dayal urged them on. On reaching the foot of the pass, Major Dayal decided to leave the track and climb straight up to surprise the enemy. He and his men climbed the difficult hillside by night carrying heavy loads through the rain, often wading through knee deep water. At 0430 hours they hit the Uri – ­Poonch road. They had a short break. By 0600 hours they had arrived at the foot of the Pass. They now came under fire from the enemy. Leaving the leading platoon and the artillery officer to engage the enemy, Major Dayal took the rest of his men to the right, climbed the western shoulder of the Pass and then rolled down on the enemy from a flank. The Pakistanis were completely surprised. They left their weapons and ran down the hill and escaped. Thus 1 PARA captured the Pass by 1030 hours on August 28. The enemy brigade was stung by this loss and counter attacked on August 29. 1 PARA repulsed the counter attack and over the next two days captured a few other features and consolidated their position. They held firm till the cease-fire. Major Ranjit Singh Dayal was awarded the Maha Vir Chakra for his gallantry and leadership in the battle. The eastern thrust required to converge on Hajipir got stalled. 19 PUNJAB also commenced operations on the night of August 26. It captured Pathra but got stalled at Bedori, a strongly held feature. An attempt by 4 RAJPUT from the north also failed. 19 PUNJAB attacked again the next night and captured the feature by evening of August 28. 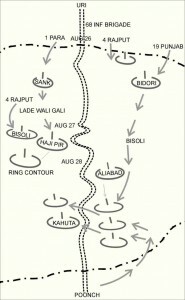 4 RAJPUT, the third battalion of the brigade captured Bisali, an enemy position west of Hajipir on September 5. The enemy counter attacked Bisali and succeeded in recapturing it. The Rajputs fell back on Sank. The link up with 93 Infantry Brigade took place on September 10. 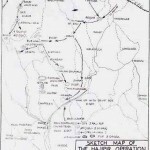 The entire Hajipir bulge was thus captured by Indian troops. The Battalion not only captured the objectives allotted to it in the Phase 1 of the Brigade attack but also the task allotted to 4 RAJPUT in Phase 2 of the Brigade attack. The capture of Hajipir Pass by 1 PARA was a remarkable achievement. The Battalion not only captured the objectives allotted to it in the Phase 1 of the Brigade attack but also the task allotted to 4 RAJPUT in Phase 2 of the Brigade attack. It is perhaps relevant to examine how this was possible. The first apparent reason was achievement of surprise. A silent attack in difficult terrain in most adverse weather conditions caught the enemy defending Sank by surprise. They did not expect a major attack and were literally caught sleeping. Even the enemy troops defending the Pass were surprised by the speed of movement of the Indian troops and assault from an unexpected direction and fled without offering a determined fight. The second important reason for the victory was the ability of the Battalion to exploit success. A defeated enemy requires time to regroup, reorganise and put up a fight. 1 PARA gave the enemy no time to reorganise and put up a fight after the loss of Sank. Their relentless offensive action without the classical reorganisation after a battle, kept the enemy off balance. The enemy could not mount a co­ordinated counter attack till September 29. By then the Indian troops had been able to consolidate their position and were able to beat back the counter attack. The third important reason for the success was leadership. The leadership of Brigadier Bakshi and Major Dayal was outstanding. Their gallantry and personal example inspired their men to perform great feats of bravery and endurance and achieve what was considered impossible. I wish if our basic schools education system can include a subject to be taught to our children through text books, short films the brave stories of galant like Maj, Dayal , Brig Bakshi, Maj Kuldeep Singh Chanpuri, Cap Batra, Capt Nayyar, Capt Thappar, Capt Pandey………………………many many more. The act of bravery, the decisions taken at difficult moments, the SACRIFISES ….all these facts should be communicated to our children. Certainly formation of our children growing under canopy where such messages of our soldier’s sacrifices are communicated to them , will lead to produce dedicated youth for country, honest politicians for our country. Thanks for the very informative article on this Hajipir Battle .We are proud of indian armies supreme sacrifice and bravery.My father Late Sub Major Sudhakar shimpi of AOC also took part in 1965 War. I am capt V Beniwal and tasked to prepare a presentation on battle oh Haji Pir .I read your article . It was really very helpful for me . I request if you can mail me presentation and some photographs on the said topic . I will be thankful to you. Good information about the battle we are beginning to forget. My father Brig (retd) Shamsher Singh, AVSM was the sparrow of 68 Bde. He has been invited by the MCTE Mhow to speak to the youngsters about the battle of Hajipir. I have forwarded your article to him. His e-mail is brigshamsher@yahoo.com. He would like to interact with you and also share some photographs so that his presentation would be a good one.